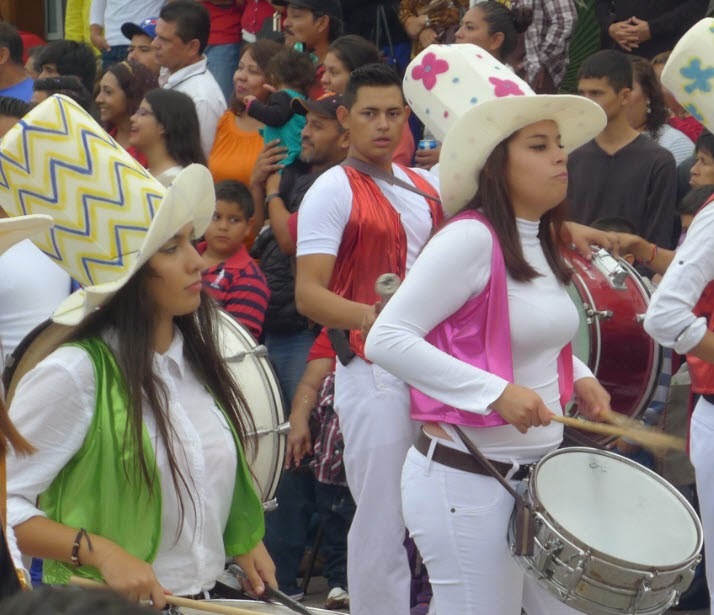 Guayas Carnaval is an amazing celebration with parades and music every day. It's a sad state of affairs this evening. For starters I overcooked the quinoa. The fish was cooked perfectly, breaded then fried in coconut oil. The salad was fresh and tasty, even though (in my opinion) there were too many green onions in it. You see, at the market the old guy selling onions forced three big bunches of onions on Connie, who only wanted one. He assembled the tomatoes, peppers, an onions together and said 20 pesos for all. Well for that kind of deal what could she do but take the three bunches of onions. Clearly he was wanting to clear out all his inventory so he wouldn't have to carry so much home. Instead of giving away two of those bunches of onions to our boater friends at the dock, Connie is putting lots of onions in everything we eat. Onions in the eggs, onions in the soup, onions in the salad. But I'm getting off track here. The big item tonight is that I overcooked the quinoa. It is mush. And, as it was pointed out to me, it cost $3 a pound when we bought it in that fancy Phoenix Arizona store. We put some butter on top and just shoveled it in, as bland as bland can be. 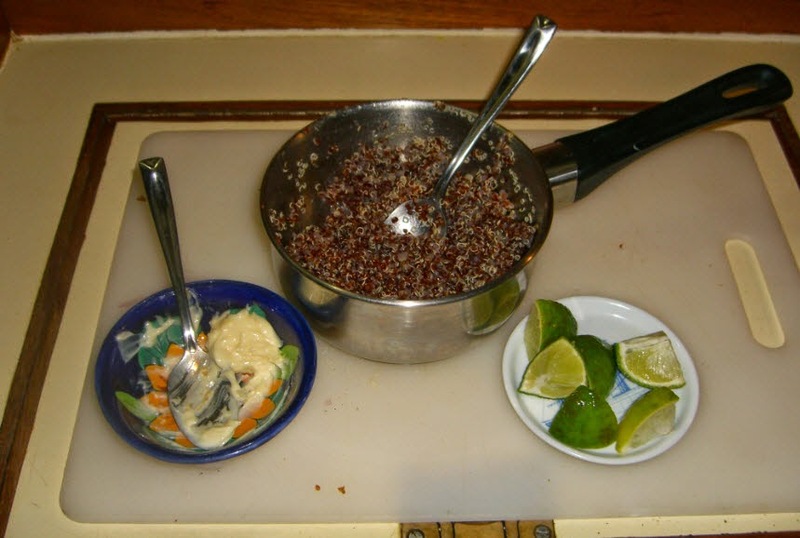 Actually the quinoa and the onions are just a ruse to get you feeling sorry for us. I'm just bubbling over with joy right now but feel I have to suppress it by bring up the mundane. 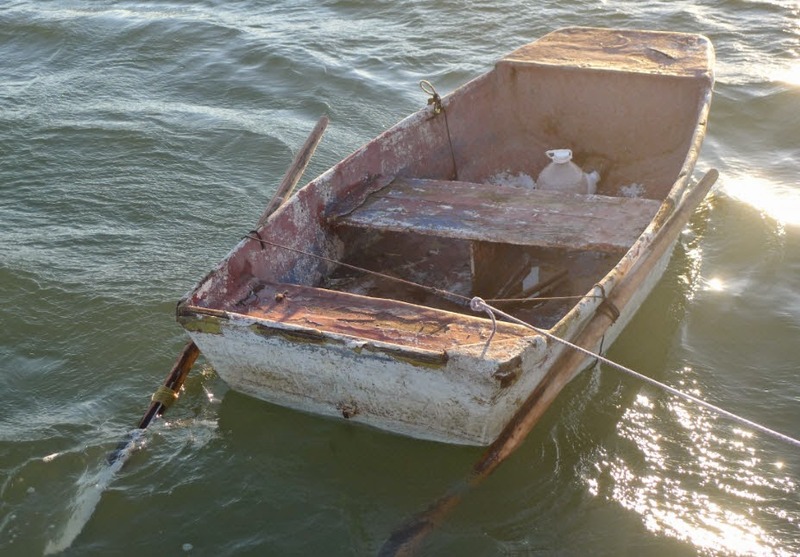 The real news is that our boat is ready for the high seas! The coupling and spacer are in and balanced. The whole thing runs smoothly. So smoothly you could cut a diamond on top of that engine. Remember that car commercial that touted its ride as being so smooth that you could cut a diamond while riding in the back seat? They actually had a diamond cutter from De Beers sitting in the back seat of that Lincoln Continental. Well, call that De Beers company and get that guy over here so he can cut a diamond on top of our new Beta 43. We also had to wait on our hatch cover to be straightened. You see, it had been leaking ever since I jibed the boat and forgot to close the hatch. The boom vang hooked onto the open hatch and ripped it off its hinges. In Barra de Navidad I had the Jon-Co guy fix it but he fixed it crooked so that every time it rained it leaked like a sieve. This time we took it to Luis Hernandez, a wonderful man with a machine shop here in Guaymas. He did a bang up job and we got it from him today and installed it using contact cement for the gasket, silicon adhesive for the glass, and construction adhesive for the deck to frame joint. Lots of smelly glue type things. Now it is raining but that's OK because the Carnaval concert stage is quiet for once. Maybe we can sleep without earplugs tonight. Then, with any luck, we'll pick up some fresh produce in the morning, pay the slip fee and sail away to the south. 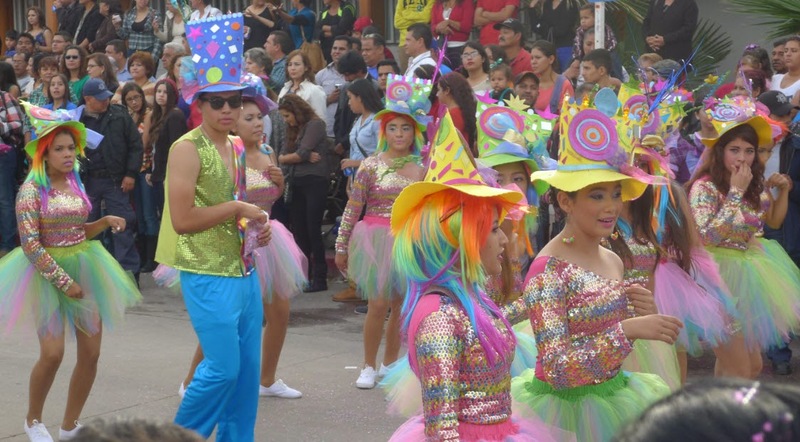 We enjoyed the festivities here in Guaymas. It's been a blast. 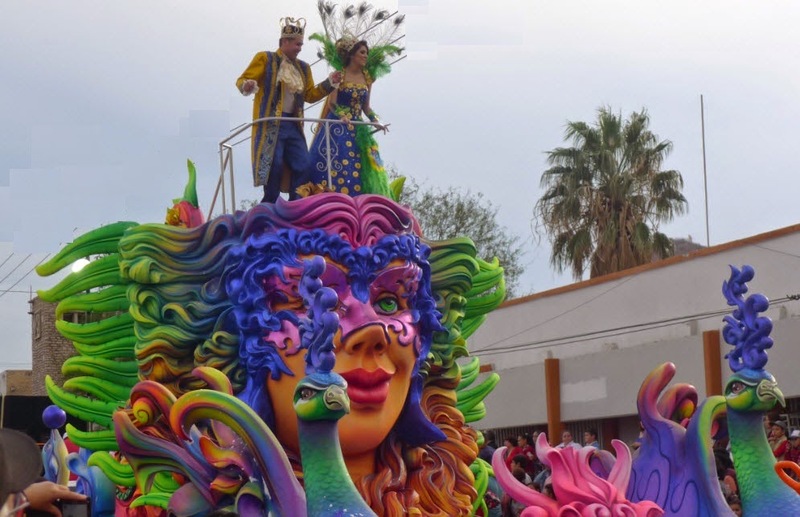 We saw a great parade yesterday with lots and lots of colorful dancers, beautiful floats, and confetti everywhere. Each night there are fireworks and tonight the fireworks show was spectacular. The theme was: Hooray for Traveler. She can finally get the heck out of here! Everyone is happy that Traveler is finally heading south! And as I close this blog entry the rain has stopped and a band has started playing on the Carnaval main stage. The bass is so loud I can feel it in my chest. But no worries, we'll let it rock us to sleep, earplugs and all and tomorrow we'll slide on out into the deep blue Sea of Cortez. Our last evening in the yard. Having served our time here in Guaymas Sonora Mexico we have come to know the lay of the land. We’ve learned a thing or two. When we pass this way again the memory cannot help but be diminished so I thought I’d jot down a few notes for future reference. 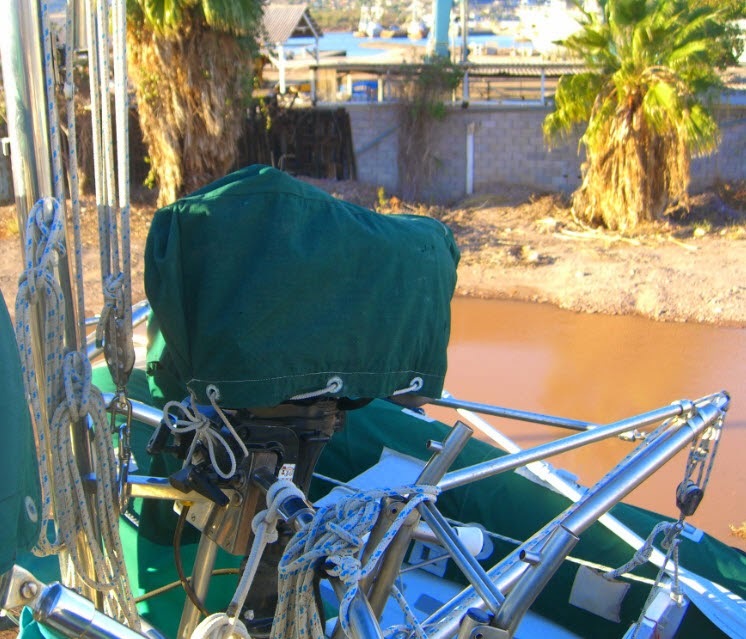 Too, this will benefit any reader who stumbled by this blog entry while searching on information about hauling out and getting boat work done in Guaymas or San Carlos. As a place to haul out and get work done this is a good option… IF you are somewhat of a do-it-yourselfer you will really enjoy being able to do your own work in the yard. If you like standing back and letting someone else do the work then that’s available too. My opinion: Even if you are not used to doing your own repairs you will benefit by diving into the details along with the mechanic or painter or rigger. We might be talking about a learning curve, but that’s a good thing. 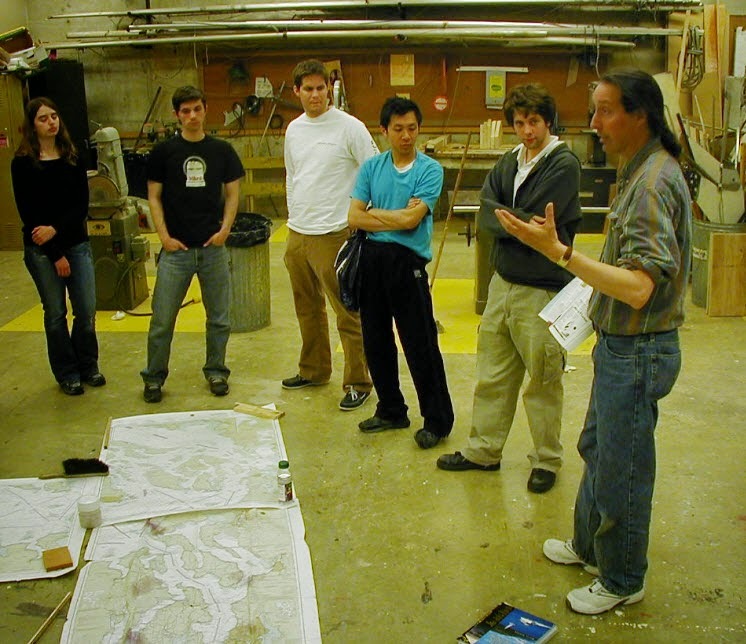 The best education is by observing and doing. Spend the time to understand what’s happening and what the options might be. Expect some blind alleys where you and the mechanic think you are doing the right thing but it finally becomes apparent that you need to stop, turn around, and try something else. If you are not actively participating in the process then you won’t know when to call the halt. After all, it is your money, and thus, your decision in the end. You are driving the bus. There is some bit of pride in everyone, ain’t that the truth? Especially here in Mexico you’ll find the tradespersons to be sensitive about the quality of their work. Use your people skills to honor their work and yet guide them in the direction you want to go. Take the time to shoot the breeze with them. Joke around a little. Ask about the family. Then get down to business. Doing so makes everything go much smoother. If they like you and think you are an honorable person they will do their best for you. If they see you as critical, haughty, or judgmental then the quality of work might suffer and the price could go up. But I digress in my preaching about how to conduct yourself in a foreign country. 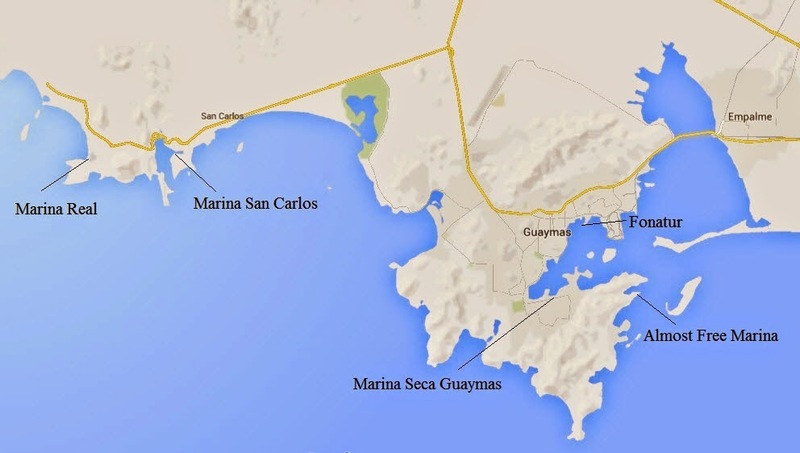 Let me shut up about that and get back to talking about the lay of the land in Guaymas. 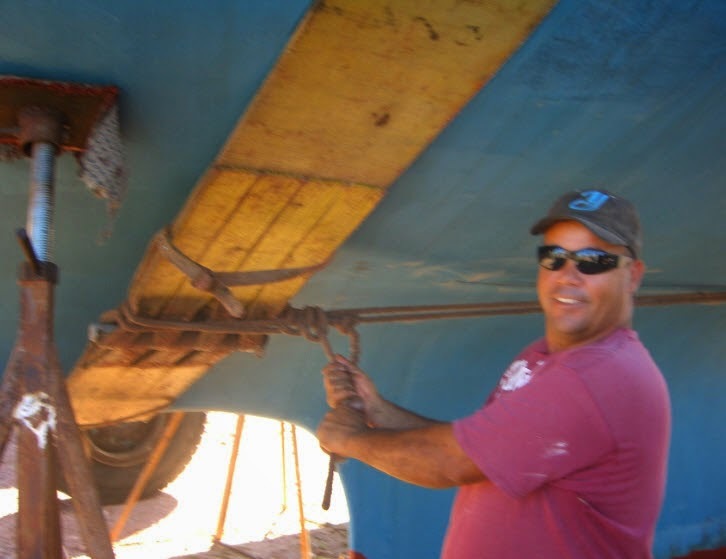 We chose to get boat work done in the Guaymas/San Carlos area for many reasons. Located in the south of the state of Sonora, this area is in the “No Hassle Zone” and as such you can bring down your US car without a temporary import permit. Being only four hours from the border, you can make quick runs to Nogales, Tucson, or Phoenix for parts. If you know someone in one of those cities you can have your parts shipped there. Our friends ordered a part and had it shipped to the Nogales Motel 6 where they agreed to accept the shipment as long as they prepaid their room reservation. The trip north is pleasant with good roads and few tolls and it’s a short enough trip that you don’t need to drive at night. We don’t drive in Mexico at night. If you don’t have a car, Tufesa and TAP busses run multiple times per day. We brought a new transmission down with us on the bus and nobody blinked an eye. If you are presently cruising Mexico then you probably have Shawn Breeding and Heather Bansmer’s Sea of Cortez guidebook. 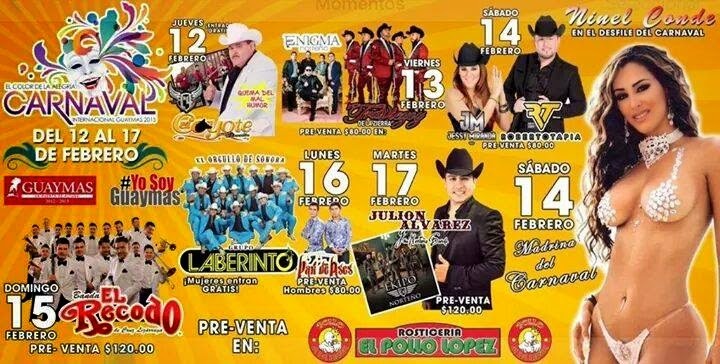 Consult this for places of interest and street maps for both Guaymas and San Carlos. There are four haul out facilities in this area. 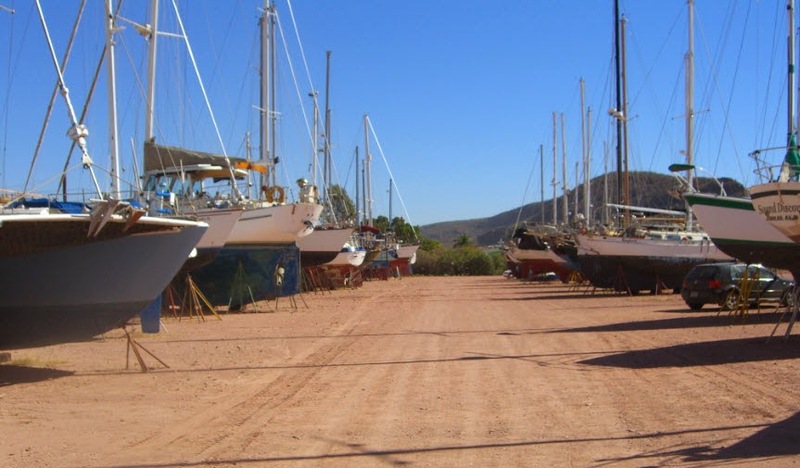 In San Carlos you have Marina Real and Marina San Carlos, both with travel lifts and work yards. Marina San Carlos is the more reasonably priced of the two and has the lion’s share of the business. You haul out at the marina and the 60 ton Hydraulic trailer travels the half mile inland to the dry (seca) yard. The seca is divided into two sections, one for storage and one for work. You can’t work on your boat or stay overnight in the storage yard. Because the work yard is more expensive you want to get your work done quickly and get her moved into storage as soon as possible. To us, this situation was a little too restrictive. 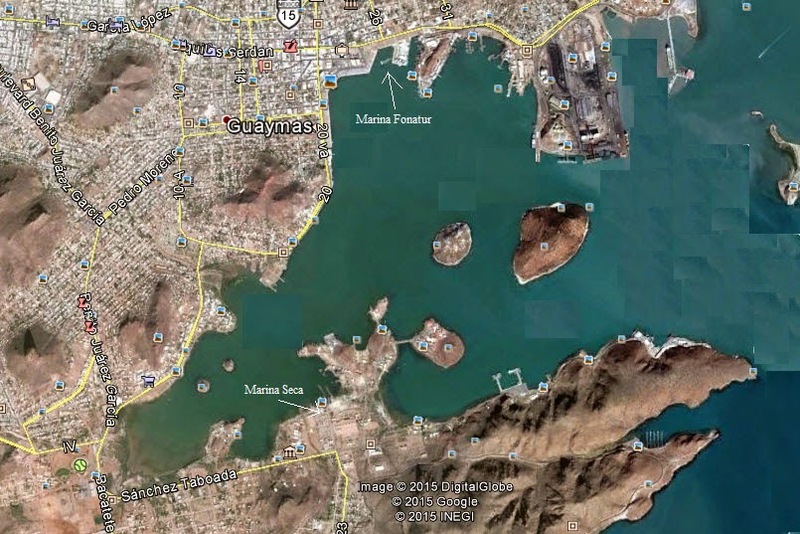 In downtown Guaymas there is a Fonatur Marina with slips for about ten good size boats depending on their draft. The boat yard and lift at Fonatur are nice but expensive. Most people haul out at the south end of the bay at Marina Seca and when the work is done they launch and head over to Fonatur for a few days to provision the boat, check out the systems, and wash all the yard dirt off the deck. Another option is to head around the corner to the Almost Free Marina, named such because sometimes you pay to tie up there and sometimes not. It's a small collection of five finger docks that were built to compensate the panqueros (panga fishermen) for when the Fonatur developers took away their landing in downtown Guaymas. A problem with the Almost Free Marina is that your outboard motor or bicycles might disappear in the night. Be careful. Oh, and there is no water or power. Marina Seca is a mile or so south across the bay from downtown. There are no docks there, just a haul out facility and two large dirt yards. The whole bay area is fairly shallow so if you draw more than six feet, pick a high tide to enter the ways then pick another high tide when you’re ready to splash. Full moon and new moon times have the highest highs. As you head toward the south end of the bay it will get shallower and shallower. Just off the ways is a white buoy. Anchor just off that buoy to wait for your haul out appointment. 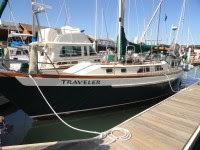 Traveler stayed overnight in the ways and left on the morning high tide. The dredged channel heads straight out. We usually arrive in the afternoon, anchor in 9 feet then haul out in the morning when the tide is full. From the white buoy, head directly east, watching the ways with your binoculars. When you can see right down the middle of the two runways make your right turn and head straight in. You’ll be talking to Arnulfo or Andrew on the VHF and they can wave you one way or the other if you get off track. The channel is dredged but narrow. Go slow so if you do run aground you can get off easily. The crew will take your lines and they might turn your boat around if it fits better going in the lift backwards. We go in forward but remove the forestay and the staysail stay so the lift can get the weight centered properly. Have your tools ready to do some demolition and don’t worry about taking up too much time. The haulout crew is very patient. 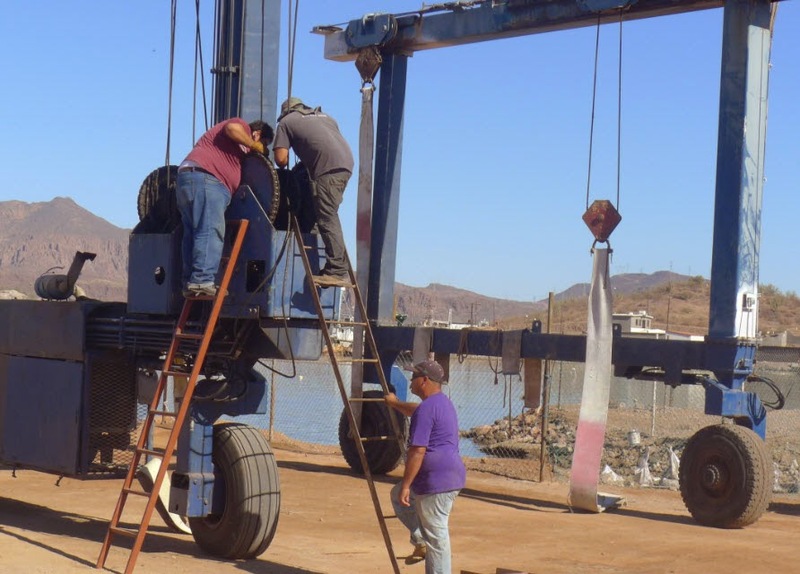 The wonderful thing about the Guaymas Seca yard is that there are few restrictions on what work you can do. As the boat owner, you can paint, grind, weld, fiberglass, bang on things, curse, and drink beer in your folding chair in the shade of the hull. You can park your vehicle right next to your boat and come and go as you wish, day or night. The yard is full of people from many nations all working on their boat projects so if you have a challenging project you can walk around and find multiple old salts who have resolved your very problem. Of course, you’ll get many different solutions, all of them the best. The only problem I’ve found with the scene at the Guaymas Seca is that sometimes you get too much advice. I just nod and smile. Gabriel Larios runs the operation and has an office on the south side of the old yard. Call him on the phone. 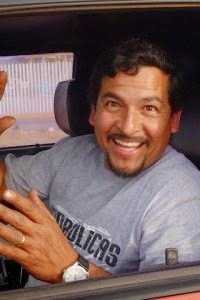 He is fluent in English and Spanish and who knows what other languages and can schedule your haul out. 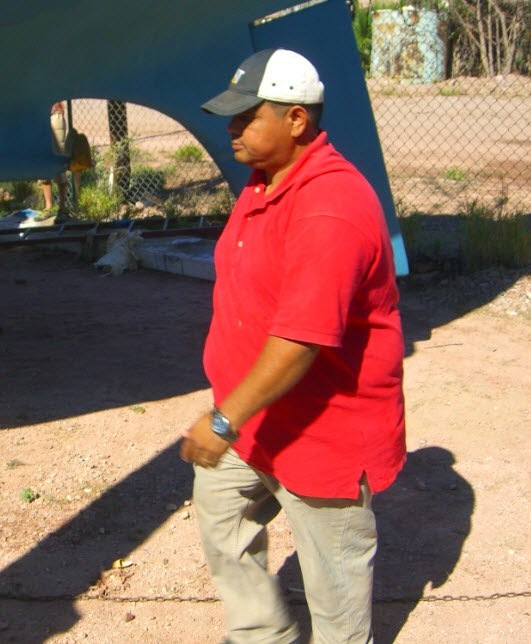 Arnulfo is the yard boss and has years of experience. He’s a good resource for a second opinion on marine engineering problems. His little office is perched up high in the new yard. Andrew runs the lift and Roberto assists. That’s it for permanent crew there outside of the guards which they have three, one at each yard gate and one who sits down by the water watching for poachers approaching by small boat. The old yard has the ways for hauling out and room for big catamarans and trimarans. 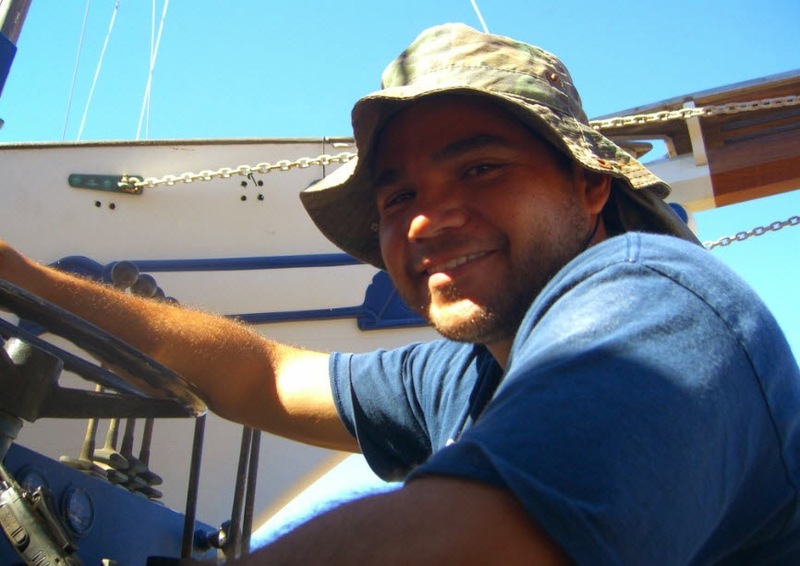 If your boat is too big for the 30 ton travelift then Gabriel can arrange for the shipyard next door to haul you out and carry your boat to his yard. Old customers who have been coming here for years have their favorite spots in the old yard and it seems like Gabriel lets them keep coming back to the same spot each summer. The new yard is across the dirt road to the east and has lots of room for boats and car storage. It seems like new customers with monohulls less than 50 feet long all go into the new yard. Both yards are protected with fencing, razor wire, and guards. Your first time in you sign the clipboard. After that the guards will recognize you and let you come and go. Eventually you will get to know them by name. The main yard has a set of restrooms with showers in the middle of the yard. A new, very nice, set of restrooms and showers are outside the yards between the Seca and the main road. These are locked at 5:00 PM each night so get your shower in early if you want to use the nice facilities. When there is a 4:00 stampede watch out, you might get the last (and cold) shower. Of course, in the summer the hot water is hot and the cold water is hot. Everything is hot. In the yard you have electricity and water. For some reason the water is turned off at 5:00 PM. There is one rate for the boat and one rate for living aboard and using power and water, so while you are gone you get a nice cheap rate, and when you are there living and working in the yard you pay an extra $5 a day… still very reasonable. We save our vegetable food scraps to feed the sheep that Gabriel keeps in a pen next to the new yard. There is a constant new supply of lambs being born… very cute. Mechanics, painters and other tradespersons come to the yard and do work but they must clear it with Gabriel. Francisco paints and does fiberglass work. Omar does mechanical work. Carlos does rigging. These are just the ones I know. There are other people you can hire to get all kinds of work done. They are allowed in the yard from 8 AM to 5 PM M-F, 8 AM to Noon on Saturday, and on Sunday they are in church. A couple of different water venders come into the yard, driving around in old pickup trucks full of garafons of water, beeping their horns, the whole family aboard. He’ll carry the big 20 liter jugs up the ladder so you can pour them into the tank. 13 pesos a pop, plus a little propina (tip) . 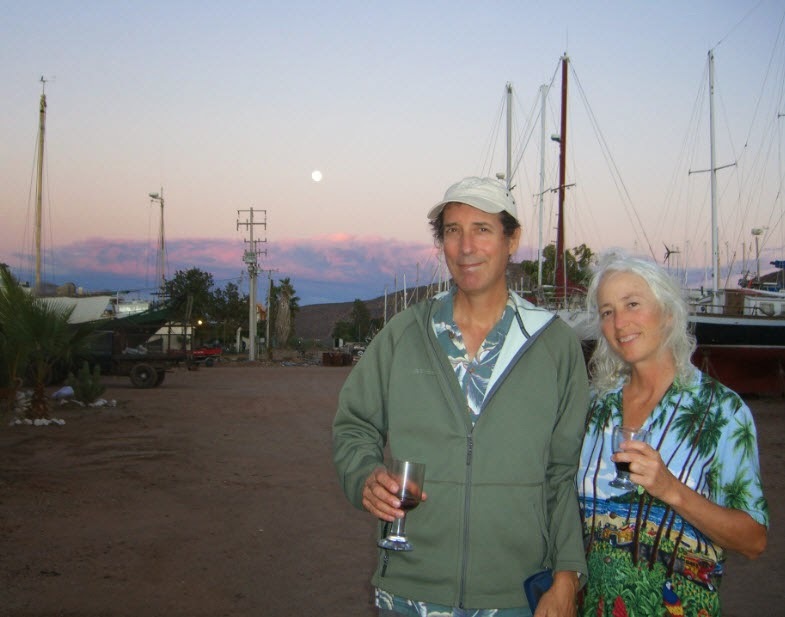 Read another blog entry about the boatyard by Ann and Doug on Galivant: What's to like about living in the shipyard. 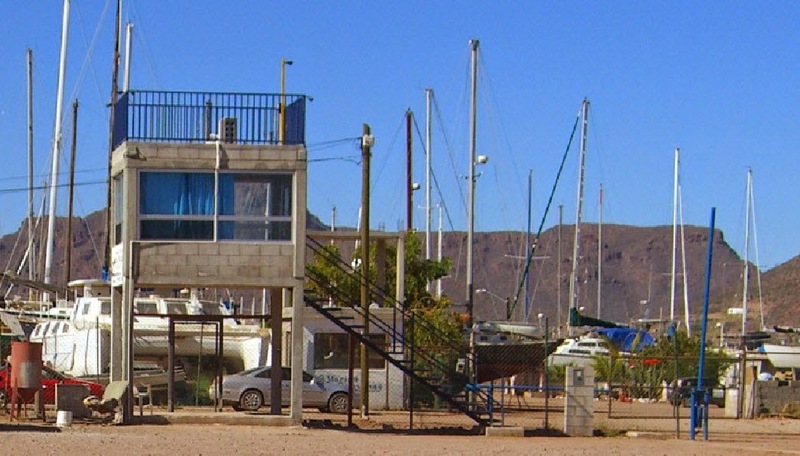 Marina Seca is a little bit outside of Guaymas proper and so requires a bus ride to get into town. Catch the Paraje Fatima bus for 5.5 pesos and ride all the way downtown to hardware stores and the markets. Across the street from the Seca is a hardware store and a beer store but other than that there is not much close by the yard. Most of the hardware stores have a small storefront but large storage areas so be prepared to show them what you need or spell it out in Spanish. Chances are, they can find it in the back. If not, they will tell you where to go to find it, even if it is at a competitor’s ferreteria. The new yard is clean and flat. A little dusty when the wind gets up. Stainless steel nuts and bolts can be had in a little specialty shop named La Cora on 17th and Garcia Lopez. Luebberts on the Malecon has some hardware and paint items that relate to marine applications. You can get bottom paint and two part epoxy paint at the International paint store on Adolfo de La Huerta (from Serdan go three blocks north on 20th and turn left) but the bottom paint is in 5 gallon cans. Find someone in the yard who is also painting their hull and split a can with them to save money. You can get single gallons of bottom paint at the local Comex on Calle Diez. For West Systems fiberglass supplies you have to make a trip to San Carlos. Take the bus downtown then at the Mercado wait for a bus with the words “San Carlos” on the windshield. Star Marine in San Carlos is the only US style marine store in the area and has the monopoly on marine specialty items. Have your credit card ready to spend big bucks. On Wednesday there is a street market downtown where you can buy wonderful fresh produce and all sorts of used tools. On Saturday the street market is nearer to the Marina Seca at the Beisbol soccer field complex one mile west. With a car you can go to the evil Walmart or Sam’s club for big provisioning and you can hit Home Depot to not find what you are looking for and pay twice as much for it. On Wednesday go to Pollo Feliz and get one and a half grilled chickens for the price of one chicken. We eat on this for three days of lunches and one pot of soup from the bones. Treat yourself with a trip to The Dougout for fried oysters, shrimp, or fish at cheap prices and live music on the veranda. It’s not far from the city center on Garcia Lopez. If you are coming in or leaving by a long distance bus take the Paraje Fatima bus downtown then connect to any bus heading out towards Walmart, or vice versa. If it is evening, just hail a taxi, it is much safer. Speaking of safety, watch out for yourself here. Like any other city there are folks here who will do most anything for money. The honest and helpful people are very kind. They are clean and well dressed, proud. You can tell those who are living close to the edge because they look unkempt. They’ll try to think of a way to get some money or a favor out of you. We’ve had them offer to sell us drugs, then turn around and ask to buy drugs. Go figure. Trouble makers, bless their hearts, every town has them. 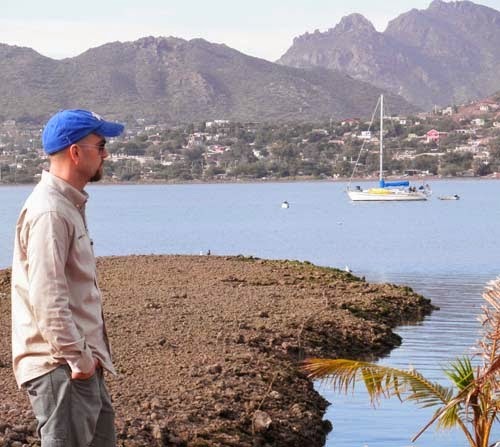 Guaymas is not a tourist town, which is refreshing because what you see is what is real life. The locals might wonder what you are doing here but they take it in stride and don’t usually treat you any differently. This is especially nice when the price you pay for your taco is the same as everyone else. We do our best to fit in and so be seen as “normal”. When we go to town I wear long pants and Connie covers her shoulders and legs. Still, she gets lots of long looks. The young single men look her up then down then watch her walk away. Maybe this is because she has long white hair and she’s tall. But they watch all women like this. That’s just the way it is. I keep my money in a safe place and don’t flash it around. For cash, I visit one of the downtown banks at the teller machine then go inside and change the big bills into smaller ones. To change USD into Pesos I go to a bank and bring a copy of my passport with me so they can take it for their records. When you enter a bank, remove your hat and sunglasses and queue up in line with everyone else. M/V Piloto goes out day and night taking a pilot to incoming and outgoing ships. This is the Fonatur marina. Out and about, I try to have change available because often times when I buy something at a sidewalk stand or small store they will not be able to make change. Street side stands are great places to eat. I had two tacos yesterday for ten pesos, about 70 cents. If you get on a bus with a 50 peso bill, give it to the driver then wait. Once he has accumulated more coins he will give you your change. When you want the bus to stop, say “Baja!” which means “down.” To flag down a bus, raise your hand up in the air. After being in Guaymas for three months we are getting a little weary of it, but I must say, it is a good town and a real Mexican town, not a tourist destination. Where in other coastal towns we are constantly approached and offered timeshares and trinkets, here we are pretty much left alone. 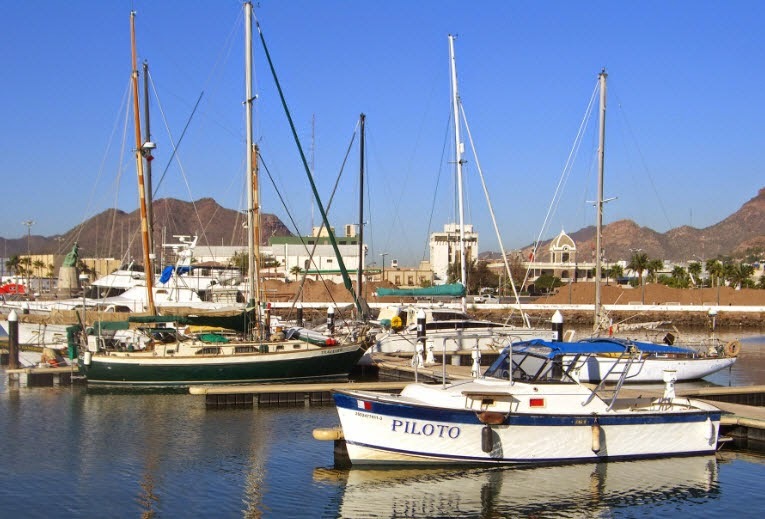 As a place to leave the boat for the summer and then get her outfitted for the next cruising season, Guaymas and San Carlos are very good choices. Since we didn’t stay in San Carlos we can’t really review that area but from what we’ve seen, it’s pretty laid back and they have everything you might need. It’s just that there are so many northerners there. Feels kinda like San Diego. But then again, San Diego is nice too. It’s all good. Todo bien! Last but not least I want to thank our good friend Omar who kept at it tirelessly until it all came together. He is a great mechanic, has an amazing attitude, and is soon to be a famous ukelele musician. Years ago, just after the millennium change, I bought a Tohatsu long shaft six horsepower outboard motor. I bought it new, it was an attractive machine, and it ran beautifully. At the time, I was teaching sailing at the Washington Yacht Club. The students were mostly undergraduates enrolled at the University of Washington but there was the occasional older UW staff member or medical school student thrown into the mix. First I taught the novice class for keelboats, sailing around Lake Union, a stone’s throw from the university. Later, I moved on to teach the skipper level class, taking the boats out in the more boisterous Puget Sound. One of the problems we had was the sorry condition of the boats and motors. This was expected because the membership dues were very low, a necessary situation so that that the students could afford the classes. The boats were sometimes donated or occasionally purchased at bargain prices and they made perfect platforms for young sailors to practice carpentry, fiberglass repair, and mechanical skills after they destroyed things by misuse or ramming the boat into the dock, which they did quite often. While simple, these boats were fairly stout. The engines were old 9.9 Hondas and they had a reputation of failing at just the wrong moment such as when you were exiting the Hiram Chittenden locks in Ballard or approaching the fuel dock at Shilshole Marina. I used to argue with the keelboat fleet captains till I was blue in the face about the state of the engines, me proposing plans on how to buy new or newer Hondas, them giving me that salty dog glare of an insulted mariner. After a particularly difficult situation dealing with a bum motor I finally bought myself the Tohatsu Six. I would then load it aboard the boat whenever we went out on Puget Sound, taking it along as insurance. If I took it along, I didn’t need it. If I didn’t, we’d have an engine failure. 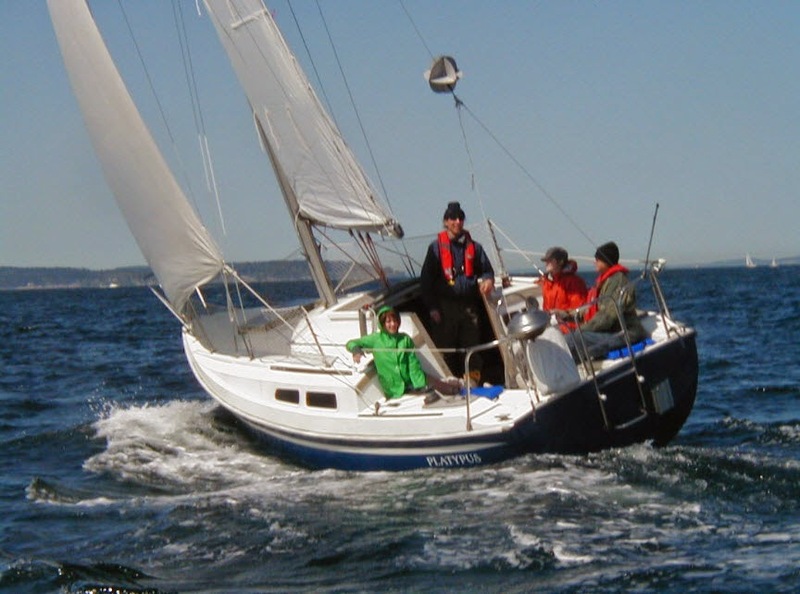 We had some great adventures out on Puget Sound in the winter with heavy seas and high winds tossing the little Catalina 27s or the Ranger 26, scaring the students and soaking everyone to the bone. Later, when we bought our first sailboat, a Newport 27, I installed a bracket on the transom to fit the Tohatsu and when our diesel engine finally died we used the little outboard to push us across Admiralty Inlet. Fast forward to 2011 and I shipped that same Tohatsu six to San Diego after purchasing Traveler, this after finding out that the outboard on her stern pushpit rail was nothing but a solid chunk of rust. We had a big Caribe tender for Traveler about ten feet long. It was a RIB (rigid inflatable boat) meaning it had a fiberglass hull with inflatable air chambers. Those chambers leaked air so we were constantly pumping the thing back up. With the fiberglass double hull the thing was pretty heavy and the water that seeped in between the floor and hull made it even heavier. It was a difficult little boat to haul on deck using the jib halyard winch so last year we finally replaced the tender with a lightweight aluminum RIB. When I mounted the Tohatsu on the new dinghy the motor’s long shaft went way down in the water and when you tried to plane, water splashed in over the low transom. This led me to say out loud, “I sure wish we had a short shaft motor!” Be careful what you wish for, my friend. 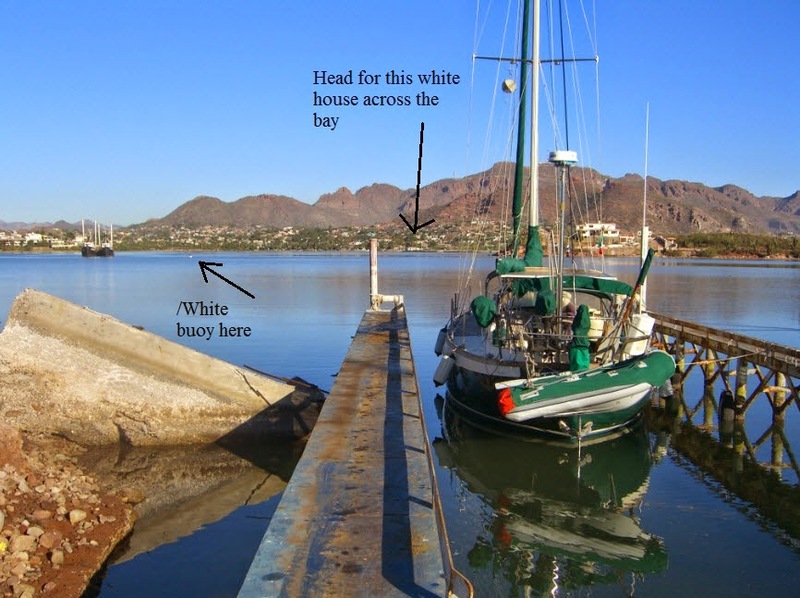 We were at the Fonatur marina in Guaymas, our second time this season. We’d had the boat on the hard all summer and fall, then launched in December only to bring her back on the hard for a prop shaft straightening. Now we had to haul out again to do it all over. Third time’s the charm! Jill and Doug on Compañera volunteered to tow Traveler south across the bay so we could anchor in our old spot in preparation of hauling out the next morning. I used the dinghy to push Traveler out of the Fonatur slip while Connie took the helm. Our buddy Mike from Pura Vida came along as a consultant and line handler. We got her lined up properly for the tow and I passed the hawser from Compañera through the tow bridle and we were on our way. Once at the south end of the bay just off the ways (haul out facility) the anchor was plopped into the mud and set. Traveler was left there on her own while we finished up some things in town then took the dinghy back to the boat for the night. As it was getting dark, we hauled the dinghy up alongside the big boat, dangling it about four feet above the water, cranking it up on the jib halyard. Nice, easy, simple. Connie asked if we should lock up the dinghy motor and, being tired (and stupid) I said no. 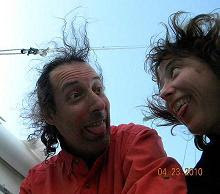 A windy night at anchor till pre-dawn kept us from sleeping well. Connie heard a noise at about 06:00, some splashing sounds, regularly spaced. She went up top just in time to see a person in a small boat rowing away towards land. Spinning around, she could see the dinghy hanging there, just dinghy, no motor. We’d been burgled! Tohatsu no more. I awoke to the sound of Connie yelling, “Bring back our motor. We have no engine. Help. Police!” Her Spanish had deserted her. Connie kept screaming bloody murder as I stumbled out of bed and onto the deck. There we stood, buck naked, staring at the slight wake of a small boat on the smooth water. I dove down below and fumbled the flare gun out of its case, loaded a cartridge and came back on deck firing four flares in the direction of the little row boat as fast as I could load. I followed those up with a big rocket that arced up into the air and exploded high above us. The little boat with the thief had disappeared into the night. On land, behind us at the haul out the guard was shining his light at us. On land to the south two pangas started towards us from the beach. Connie suggested we put on some clothes. The panga fishermen came straight out to see what all the commotion was about. They grasped the situation pretty quickly and one of the pangas took off after the scallywag. As the light filled the sky, I had one of the fishermen call the police on my cell. Then as I was boarding their panga for a ride to land the other panga came back with this little beat up rowing dinghy in tow. They found it run up on the beach, footprints leading up to the road. We tied the little rowing dinghy to our boat and I went in to shore to talk to the police and then get a ride from them to the yard where I spent the next two hours trying to find someone with an outboard motor we could borrow. Connie rowed our dinghy to shore and we mounted Chris's motor. Omar arrived and he jumped in with us as we sputtered out to the boat. Soon another larger dinghy arrived and gave us a nice push into the ways. We made it in by 10:00, the cut off time we were allowed because another boater had reserved the lift for noon. Soon the lift arrived and when lowering the slings they forgot to pull down on one of them and a cable drum got hopelessly tangled. The crew spent two hours straightening it all out, everyone getting extremely greasy and slightly pissed off. The yard owner then preempted our haul out to unload a truck off of a flatbed and by that time it was 14:00 and everyone went off to a late lunch. At this point Connie started drinking Havana Club while we sat in the ways, our keel sinking into the mud at low tide. By 16:00 the lift was back and the crew was able to worm the slings onto poor muddy Traveler. Thank dog the lift points are above the keel or one of us would have had to do some mud diving. Once she was out of the water I held my fingers crossed that the muddy slings would not slip off before they could hustle some ropes on to tie them fore and aft. We found ourselves safely back in the yard before the sun set behind the hills. Twelve hours had transpired since we awoke so abruptly. Now we could sigh, tip a glass, and try to put everything back into perspective. The yard manager said we’d for sure catch this thief because we had their little rowing dinghy. The cops said that someone would surely see us tomorrow to start the investigation. A week later, nothing has happened. We don’t really think anything will. Since then I bought a used Suzuki 6 hp outboard from a fellow boater. We had to do a little work on it to get reverse working but now it runs great. I keep it on the back rail, solidly locked. We ran into an old salt in the yard who said that’s the sixth outboard he’s heard about being stolen in the bay the last few years. Evidently this is a common thing in Guaymas and San Carlos and many other places in Pacific Mexico. Come to think of it, it is pretty common in Seattle and in other parts of the States and Canada . So be warned, take the motor off the dink and lock it to the rail or lay it down in the cockpit where it can’t be seen. A friend of ours uses a string and a bell so that if someone grabs their motor she’ll hear it. Now that’s a great idea, tie a string to my big toe and keep the flare guns handy. Then I’ll be able to blaze away and light someone on fire as he jumps for it. New Suzuki 6, covered, locked, safe. On the alignment front, we pulled the shaft, propeller and coupling off the boat and sent it back to Mazatlan. Omar had a long discussion on the phone with the Mazatlan shop, Helices Kelley, and after lots of hand waving and rapid talking he convinced them to do the right thing and do the work for free this time. Yes the shaft was bent, again. We probably did this by running it with the engine out of alignment. Instead of straightening the shaft again, Helices Kelley made us a new one, this time out of a stronger grade of steel. No charge. They reduced the propeller size again. No charge. They made a custom coupling then spun everything together on their magic machine to get everything balanced. That’s the thing about many Mexican shops, they are proud of their work. If it is not right, they’ll do it over. 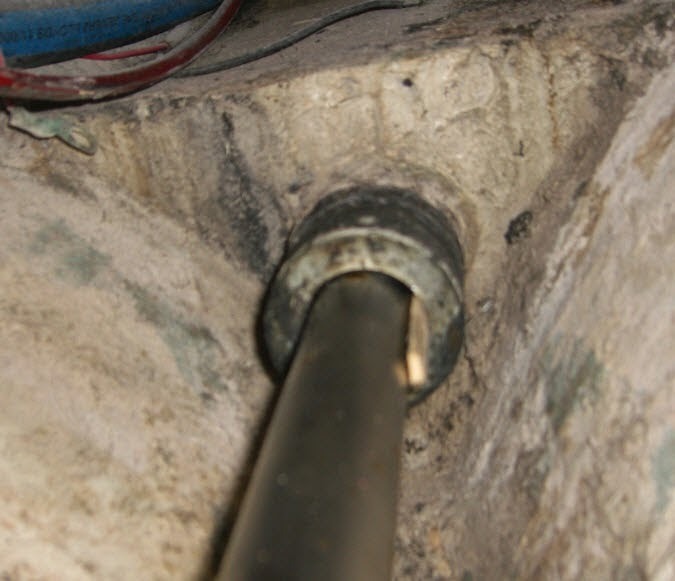 1/4 inch clearance where shaft enters stern tube. All this gear is now back in place. Tomorrow Omar aligns the engine again with reworked mounts and a newly balanced shaft and prop. We sure hope for the best come mid-week when we’ll splash again and try the magic third time. Omar removed the drip-less fitting so we could see the shaft coming out of the stern tube and it is amazing what a small clearance there is between the tube and the shaft. The shaft is 6.75 ft long and the stern tube is 4.9 ft long. No wonder why any little misalignment could cause a knocking against the side of the tube. That engine needs to run smoothly and the motor mounts must be firm to reduce any movement. On the passage making front, we’re getting ready for a Hawaii jump in April. 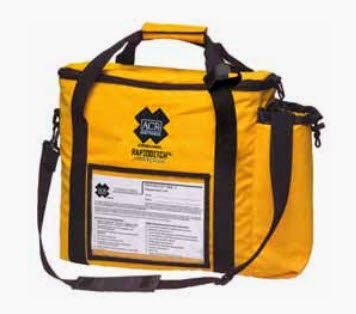 I’ve ordered a bug-out bag, figured out what emergency supplies we need outside of what’s already in the Viking RescYou offshore life raft, and started listing the items we’ll need. The raft comes with four days of water for three people but we are adding an AquaMate solar still so we’ll have water on day five, six, seven… fifty. We’ll bring three straws for when we run out of food. Short straw is the entrée.